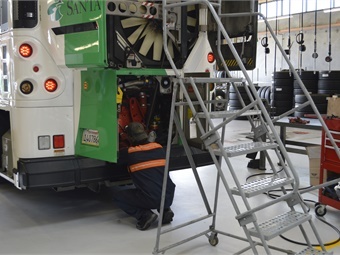 With electric vehicle usage and the transitioning to electric cooling fans continuing to grow at transit agencies around the nation, electrical (issues/training) continues to be the top issue in the shop, according to respondents to METRO’s 2016 Bus Maintenance Survey. Overall, electric vehicle usage is up six percentage points from last year’s survey, while three-quarters of this year’s respondents report that their agency is moving from hydraulic to electric cooling fans. To address the issues being caused by these changes, maintenance officials report that they are adding specialized training programs or requesting increased training from their OEM partners. When asked what new issues have had to be addressed through training in the last year, respondents reported a range of topics, including aftertreatment systems, supercapacitor care and maintenance, high-voltage propulsion systems and electric buses. Ninety-four percent of this year’s respondents reported filters as the fast-moving part they buy the most, followed by fluids and brakes. More than half of this year’s respondents reported alternators as their most-purchased lifecycle part, followed by starter motors and compressors. 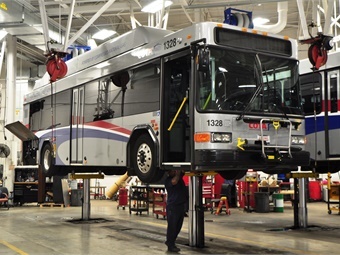 METRO sent out its survey to hundreds of maintenance shops, spanning a wide demographic consisting of large metropolitan to small and rural transit agencies, as well as university-focused systems. 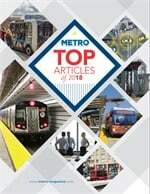 Now in its sixth year, METRO sent out its survey to even more maintenance shops, spanning a wide demographic consisting of large metropolitan to small and rural transit agencies as well as university-focused systems. Questions covered topics ranging from fleet size to average age of their fleet, hours-of-training provided per year and how that training is delivered, and the top issues in their shops to what parts they buy most often. Agencies varied in fleet size, with the largest maintaining 5,800 buses and the smallest 17, with the mean boasting a fleet of 534 buses — up significantly from last year’s 288 buses. If you have a question to add for next year’s survey or would like to participate in the future, please contact us at [email protected]. As always, thanks to all those who took the time to submit their info this year. To view the entire survey as it appeared in print, click here.